Objective To determine the comparative efficacy and safety of corticosteroids in the prevention of bronchopulmonary dysplasia (BPD) in preterm infants. Study design We systematically searched PubMed, EMBASE and the Cochrane Library. Two reviewers independently selected randomised controlled trials (RCTs) of postnatal corticosteroids in preterm infants. A Bayesian network meta-analysis and subgroup analyses were performed. Results We included 47 RCTs with 6747 participants. The use of dexamethasone at either high dose or low dose decreased the risk of BPD (OR 0.29, 95% credible interval (CrI) 0.14 to 0.52; OR 0.58, 95% CrI 0.39 to 0.76, respectively). High-dose dexamethasone was more effective than hydrocortisone, beclomethasone and low-dose dexamethasone. Early and long-term dexamethasone at either high dose or low dose decreased the risk of BPD (OR 0.11, 95% CrI 0.02 to 0.4; OR 0.37, 95% CrI 0.16 to 0.67, respectively). There were no statistically significant differences in the risk of cerebral palsy (CP) between different corticosteroids. However, high-dose and long-term dexamethasone ranked lower than placebo and other regimens in terms of CP. Subgroup analyses indicated budesonide was associated with a decreased risk of BPD in extremely preterm and extremely low birthweight infants (OR 0.60, 95% CrI 0.36 to 0.93). Conclusions Dexamethasone can reduce the risk of BPD in preterm infants. Of the different dexamethasone regimens, aggressive initiation seems beneficial, while a combination of high-dose and long-term use should be avoided because of the possible adverse neurodevelopmental outcome. Dexamethasone and inhaled corticosteroids need to be further evaluated in large-scale RCTs with long-term follow-ups. Systemic postnatal corticosteroids could reduce the risk of bronchopulmonary dysplasia (BPD) in preterm infants. Clinicians remain confused as to the corticosteroid to choose, the time to initiate and the dose to give. For preterm infants with risk of BPD, high-dose dexamethasone appears to be more effective than other corticosteroids. The comparison between different dexamethasone regimens supports aggressive initiation but cautions against high-dose and long-term administration because of adverse neurodevelopmental outcome. Budesonide is associated with decreased risk of BPD in extremely preterm and extremely low birthweight infants. New clinical trials, meta-analyses and follow-up studies have been published since 2010, warranting an updated review of the available information. Due to different comparators used in clinical trials, a pair-wise meta-analysis cannot be used to evaluate comparative effects of different corticosteroids and regimens. Therefore, we conducted a network meta-analysis of all relevant randomised evidence to comprehensively compare and rank the different corticosteroids used to prevent BPD. We conducted a Bayesian network meta-analysis using the WinBUGS V.1.4.3 software (MRC Biostatistics Unit, Cambridge, UK) and adopted a random-effects model with vague priors for multiarm trials.23 24 Pooled estimates and the probability of each treatment being the best were obtained by the Markov chain Monte Carlo method. Model convergence was assessed by trace plots and Brooks-Gelman-Rubin plots.25 The results of dichotomous outcomes were reported as posterior medians or ORs with 95% credible intervals (CrIs). The surface under the cumulative ranking curve (SUCRA) was calculated as a percentage to estimate the probability that an intervention was the best.26 Prespecified subgroup analyses were performed according to gestational age and birth weight.27 The interactions between the intervention effect and subgroups were assessed using a heterogeneity test in meta-analysis.28 29 Network geometry was performed with STATA V.13.0 software, in which the size of the nodes and thickness of the edges were proportional to sample sizes and numbers of trials involved, respectively. Of the 557 citations initially identified by searching bibliographical databases, 449 were excluded through title and abstract screening. We examined the full text of 108 reports, and identified 66 publications describing 47 RCTs that were eligible for network meta-analysis (online supplementary appendix 2). We contacted 19 corresponding authors of the included studies with missing data, and received additional data from 6 of the 19 authors (online supplementary appendix 3). The included trials evaluated five corticosteroids and involved a total of 6747 randomly assigned participants. The sample size of the trials ranged from 23 to 856 participants (median 60). The included studies recruited preterm infants with similar ranges of gestational age and birth weight, including extremely preterm with birth weights <1000 g (gestational age: median 26.7, IQR 26.0–27.9; birth weight: median 850, IQR 790–1010). According to data from 15 (31.9%) of the included trials, the average PNA at study entry ranged from 0.14 to 27 days (median 8, IQR 3.04–15.50). Thirty-eight (80.9%) of the 47 trials reported the use of prenatal corticosteroids in mothers, and 36 (76.6%) reported the use of surfactant after birth in newborns (online supplementary appendix 4). Networks of eligible comparisons for the prevention of BPD are presented in figure 1. Nine (32.1%) of the 28 available pair-wise comparisons showed direct evidence supporting BPD prevention at 36 weeks’ PMA. The results of network comparisons for BPD and CP are shown in table 1, and the results for other outcomes are available in online supplementary appendix 6A . Network of corticosteroids for the prevention of bronchopulmonary dysplasia at 36 weeks’ postmenstrual age. The circle size reflects the number of participants, and the line width reflects the number of direct comparisons. No connecting line between two treatments indicates that there was no direct comparison. The use of dexamethasone, at either high or low dose, decreased the risk of BPD compared with placebo (OR 0.29, 95% CrI 0.14 to 0.52; OR 0.58, 95% CrI 0.39 to 0.76, respectively). High-dose dexamethasone was associated with a lower risk of BPD at 36 weeks’ PMA, as compared with hydrocortisone (OR 2.53, 95% CrI 1.20 to 5.68), beclomethasone (OR 2.75, 95% CrI 1.23 to 6.78) and low-dose dexamethasone (OR 1.99, 95% CrI 1.04 to 3.91) (online supplementary appendix 6A). According to the estimated probability of being the best for BPD prevention at 36 weeks’ PMA, high-dose dexamethasone ranked first (91.2%) and beclomethasone ranked last (28.0%) (table 2). In terms of mortality, all corticosteroids failed to show any superiority compared with placebo, and no statistically significant difference was found between different corticosteroids (online supplementary appendix 6A). Compared with placebo, high-dose dexamethasone, hydrocortisone and beclomethasone tended to have a higher risk of CP, although the difference was statistically non-significant (ORs ranging from 1.47 to 2.02). No statistically significant difference was found between the five corticosteroids (online supplementary appendix 6A). According to SUCRA probabilities, low-dose dexamethasone was the first (76.8%), ranked higher than hydrocortisone, while high-dose dexamethasone was the last (26.9%). Compared with placebo, early-initiation, high-dose, long-term (EHL), and early-initiation, low-dose, long-term (ELL) dexamethasone regimens were associated with a decreased risk of BPD at 36 weeks’ PMA (OR 0.11, 95% CrI 0.02 to 0.41; OR 0.37, 95% CrI 0.16 to 0.67) (table 1). In addition, EHL was more effective than early-initiation, low-dose, short-term (OR 7.24, 95% CrI 1.60 to 43.15), early-initiation, high-dose, short-term (OR 8.56, 95% CrI 1.14 to 82.62), and late-initiation, low-dose, long-term (LLL) (OR 6.07, 95% CrI 1.09 to 37.88). No statistically significant differences were found between different dexamethasone regimens in terms of mortality (online supplementary appendix 6B). No statistically significant differences in the risk of CP were detected between different dexamethasone regimens (online supplementary appendix 6B). According to SUCRA probabilities, high-dose and long-term regimens,late-initiation, high-dose, long-term (LHL) and EHL, ranked lower than placebo in terms of CP (online supplementary appendix 7). For extremely preterm infants, both doses of dexamethasone and budesonide were effective in decreasing the risk of BPD at 36 weeks’ PMA compared with placebo (OR 0.06, 95% CrI 0.01 to 0.33; OR 0.73, 95% CrI 0.55 to 0.97; OR 0.60, 95% CrI 0.36 to 0.93), even though budesonide failed to show efficacy in general preterm infants. Moreover, high-dose dexamethasone was superior to low-dose dexamethasone and budesonide in this population (OR 11.48, 95% CrI 2.16 to 93.39; OR 9.29, 95% CrI 1.63 to 79.07). No statistically significant difference was found in terms of mortality and CP between the five corticosteroids (online supplementary appendix 8). For extremely low birthweight infants, only budesonide significantly reduced the risk of BPD at 36 weeks’ PMA compared with placebo (OR 0.60, 95% CrI 0.34 to 0.95). For very low birthweight infants, both doses of dexamethasone were associated with a decreased risk of BPD at 36 weeks’ PMA (high dose: OR 0.23, 95% CrI 0.07 to 0.56; low dose: OR 0.36, 95% CrI 0.16 to 0.70). There were no statistically significant differences in the risk of CP detected between the five corticosteroids in any subgroups. 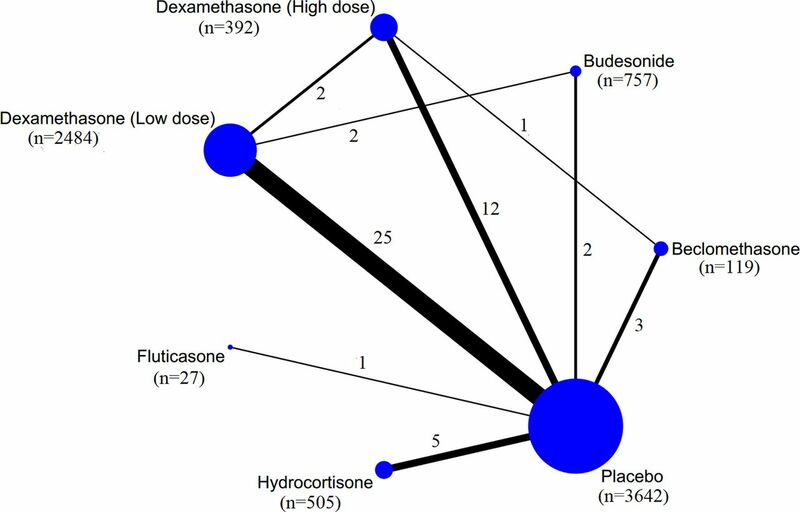 Our network meta-analysis provides unified hierarchies of evidence for corticosteroid use in BPD, overcoming the problem due to inadequate evidence from head-to-head trials. Compared with placebo, both high-dose and low-dose dexamethasone reduced the risk of BPD at 36 weeks’ PMA. In addition, high-dose dexamethasone significantly decreased the risk of BPD compared with hydrocortisone and beclomethasone. The attempt to explore the optimal regimens of dexamethasone revealed that early initiation and a high dose of dexamethasone decreased the risk of BPD, but high-dose and long-term dexamethasone might increase the risk of CP. For the extremely preterm and extremely low birthweight infants, budesonide showed a decreased risk of BPD, compared with placebo. High-dose, long-term dexamethasone regimens appeared to be associated with a higher risk of CP compared with placebo (ORs range from 2.30 to 2.75) and low-dose, short-term regimens (ORs range from 2.30 to 33.33), but without significant differences. In addition, our findings appeared to support early initiation, as both EHL and ELL were associated with a lower risk of CP compared with LHL and LLL (OR: 0.82 and 0.62, respectively). The possible explanations for the finding include the following: early-initiation, low-dose dexamethasone was found to suppress the expression of inflammatory mediators and decrease pulmonary oedema.41 The adverse neurodevelopmental outcomes of postnatal dexamethasone therapy were shown to be associated with initiation time. Early initiation of dexamethasone enhanced the acquisition of contextual fear and spatial memory later in life of rat pups and increased dendritic spine number.42 Hence, our findings challenge the use of high-dose and long-term dexamethasone, but advocate a more aggressive initiation of dexamethasone than current clinical practice. Our study has several potential limitations. First, variations in corticosteroid regimens and participants resulted in significant heterogeneity across the included studies. We therefore planned a comparison of the different regimens of dexamethasone and prespecified subgroup analyses by gestational week and birth weight. Second, missing data on the exact dose and time of outcome measures reduced the number of trials included in the network meta-analysis. In addition, patient enrolment was halted early in seven of the included trials. Five trials were terminated due to adverse reactions,31 33–36 while the other two were terminated because of difficulties in participant recruitment.30 32 Given the limited number of studies, we did not conduct sensitivity analysis on the excluded terminated trials. Finally, the effects of corticosteroids on adverse neurodevelopmental outcomes remained unclear due to the lack of trials with long-term follow-ups. For preterm infants with risk of BPD, dexamethasone can reduce the risk of BPD, and high-dose dexamethasone is more efficacious than other regimens of corticosteroids. Of the different dexamethasone regimens, aggressive initiation seems a favourable option, and a combination of high-dose and long-term use should be avoided because of the possible long-term adverse neurodevelopmental outcome. Budesonide is associated with a decreased risk of BPD in extremely preterm and extremely low birthweight infants, although recommendations cannot be made due to the lack of long-term safety data. RCTs of early-initiation and low-dose dexamethasone, budesonide and other inhaled corticosteroids with factorial design and long-term follow-ups are urgently needed to identify the optimal postnatal corticosteroid regimens. We thank Professor Imti Choonara for his suggestions on this paper. We also thank the authors of the six included studies who responded to our request and provided additional data to this meta-analysis.
. Eunice Kennedy Shriver National Institute of Child Health and Human Development Neonatal Research Network. Neonatal outcomes of extremely preterm infants from the NICHD Neonatal Research Network. Pediatrics 2010;126:443–56.
. Bronchopulmonary dysplasia. AmJ Respir Crit CareMed 2001;163:1723–9.
. NICHD Neonatal Research Network. Intercenter differences in bronchopulmonary dysplasia or death among very low birth weight infants. Pediatrics 2011;127:106–16.
. Late (> 7 days) postnatal corticosteroids for chronic lung disease in preterm infants. Cochrane Database Syst Rev 2014;5:CD001145.
. Early administration of inhaled corticosteroids for preventing chronic lung disease in ventilated very low-birth weight preterm neonates. Cochrane Database Syst Rev 2012;5:CD001969.
. Changes in the use of postnatal steroids for bronchopulmonary dysplasia in 3 large neonatal networks. Pediatrics 2006;118:1328–35.
. Inhaled salbutamol and beclomethasone for preventing broncho-pulmonary dysplasia: a randomised double-blind study. Eur J Pediatr 1998;157:926–31.
. Inference from iterative simulation using multiple sequences. Stat Sci 1992;7:457–72.
. 7 days) postnatal corticosteroids for chronic lung disease in preterminfants. Cochrane Database Syst Rev 2009;1:CD001145.
. How to use a subgroup analysis. JAMA 2014;311:405–11.
. Dexamethasone treatment in preterm infants at risk for bronchopulmonary dysplasia. Arch Dis Child 1993;68:566–9.
. A Prospective, Randomized, Double-Masked Trial Comparing Low-dose to Conventional Dose Dexamethasone in Neonatal Chronic Lung Disease. Int J Pediatr Neonatol 2004;5:e10473.
. The effect of early dexamethasone administration on bronchopulmonary dysplasia in preterm infants with respiratory distress syndrome. J Pediatr 1998;132:48–52.
. Adrenal suppression and extubation rate after moderately early low-dose dexamethasone therapy in very preterm infants. Early Hum Dev 2003;74:37–45.
. Protective effects of dexamethasone on early acute lung injury induced by oleic acid in rats. Int J Clin Exp Med 2014;7:4698–709. Contributors LZe conceived the study, drafted the study protocol, analysed the data, and drafted and revised the manuscript. JT revised the study protocol, and analysed and interpreted the data. FS contributed to the conception and design of the study, analysed and interpreted the data, and revised the manuscript. WL and LJ selected the articles, extracted data and analysed the data. GG and YZ extracted data and assessed the risk of bias of included studies. LG analysed and interpreted the data, and revised the manuscript. JS contributed to the conception and design of the study, revised the study protocol and interpreted the data. XS revised the study protocol, interpreted the data and revised the manuscript. DM contributed to the conception and design of the study and revised the manuscript. LZa conceived the study, interpreted the data, and drafted and revised the study protocol and manuscript. Funding This study was funded by the National Natural Science Foundation for Young Scholars of China (no 71503177) and the National Natural Science Foundation of China (no 81373381).